Have you ever heard the words “ancillary services” referred to in the electric industry and wondered just what does this mean? Read about the most expensive and significant of these services to help give you a better understanding of what is included in these cost components and the necessity of these services to ensure safe and reliable power is available to you. Have you ever heard the words ”ancillary services” referred to in the electric industry and wondered just what does this mean? Merriam-Webster dictionary defines the word “ancillary” as something that is “auxiliary” or “supplementary.” When most of us think about electricity, we think about having immediate access to power for our electrical devices, whether by the flick of a switch, or by plugging a device into the electrical wall outlet. We may think about how the power is provided, but not about all the “ancillary” components that are necessary to allow for that instantaneous on and off usage to take place. Almost all electricity we utilize is produced as it is needed. As millions of consumers turn on their lights throughout an evening, the electric grid operator must request that power generating units increase their power output to meet the new electrical demand. For example, when large electrical furnaces are turned on to melt metals, electrical power generation must increase rapidly and then maintain this increased production. Generators must also decrease output as a response to reduction in electrical usage. As each generator’s output is increased or decreased, additional wear and tear takes place on the equipment within the power plant. Electric grid and market operators attempt to provide compensation for these needed services by developing ancillary service charges. Almost all charges related to ancillary services are based on the consumer’s electrical usage. Let’s chat about the most significant of the numerous ancillary services that are needed for the reliable delivery of electricity. Ancillary services may be line-item charges or embedded within a total energy charge depending on the utility zone or product plan selected by the retail customer. Regulation Service is an ancillary service provided by resources that can respond quickly to the instantaneous change in electrical demand, often represented as a regulation signal. These resources, which are typically some type of electricity generator, demand response, or sources storing and then releasing electricity, may offer this service based on constructed formulas. Some of the items impacting a resource’s revenues when providing this type of service are whether it has the ability to respond quickly or slowly to a regulation signal and how well the resource can follow the regulation signal. A resource that can follow the regulation signal better than other resources will receive more revenue for this service. 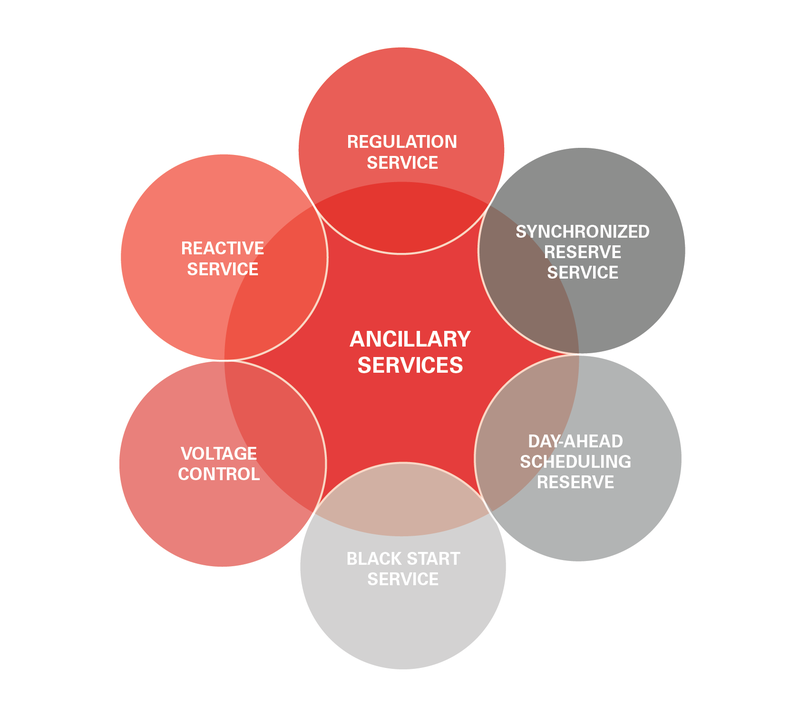 Synchronized Reserve Service is an ancillary service designed to ensure that there is enough “headroom” or unutilized energy on resources to increase output to ensure abrupt changes in electrical supply or demand can be met. A demand response resource, or aggregate of demand response resources, may provide this service by rapidly reducing electricity usage. A prime example of why this service is needed is for the sudden loss of generation or a loss of transmission capability. If a generator stops producing electricity due to a sudden operational issue, other resources must respond quickly to provide the “missing” power. For the most part, this market product clears at zero cost due to adequate supply or “headroom” on the system. When there is high demand for electricity, the price associated with this service could increase as the grid operator has to pay resources to be in an operating position to provide this service. Day-Ahead Scheduling Reserve (DASR) is cleared a day prior (day-ahead) to the actual need of the ancillary service and is utilized to ensure a sufficient quantity of resources, including demand response, are in the operational position of being available to provide 30-minute reserve service in the real-time market. There are numerous non-market-based ancillary services; however we will only discuss two potentially expensive services. The Federal Energy Regulatory Commission, (FERC), has oversight of the wholesale electricity markets and approves these service-related compensation mechanisms. Black Start Service is an ancillary service that is paid to certain generating resources that can begin providing electricity to the grid without first utilizing outside power from the grid to initially start power generating stations. Black start is necessary if there are large black outs on the power system. The power output from these resources is utilized to start other power stations, provide electricity to nuclear stations, and provide critical-needs services. The compensation for resources providing this service is an annual FERC-approved, cost-of-service rate. As new black start resources begin operation, or as existing black start resources retire, significant changes to this charge can occur. Voltage Control and Reactive Service is a FERC-approved rate that provides basic compensation for a generator to provide incremental voltage or to absorb voltage on the transmission system. This type of service is local in nature. In other words, you may have portions of the electrical grid with both normal and abnormal conditions depending on the configuration of generators, loads, and the transmission system. These charges can grow beyond FERC-approved charges if the grid operator must turn on or off a generator or substantially modify the output of a generating resource to provide this service thus inhibiting the resource’s ability to participate within the economic energy dispatch of the grid. To conclude, ancillary services consists of a wide variety of provisions. We touched upon the most expensive and significant of these services to help give you a better understanding of what is included in these cost components and the necessity of these services to insure safe and reliable power is available to you. AEP Energy is here to help you fully understand these charges, as well as pursue opportunities to increase your revenues. Contact us today. During the month of August, both natural gas and power moved higher on what had been oversold conditions. Prompt month (September 2017) natural gas jumped $0.246/MMBtu to close at $3.040/MMBtu. Balance of the year, October through December 2017 was up $0.180/MMBtu to $3.125/MMBtu. Further out the curve, Calendar (Cal) 2018 was up $0.125/ MMBtu to $3.038/MMBtu, while Cal 2019 was up $0.061/ MMBtu closing to $2.859/MMBtu at the close of August 2017. In power, with the exception of the front month being down due to weak liquidations, the rest of the curve followed natural gas being higher. For example, September 2017 (prompt or front month) on-peak AEP-Dayton Hub was down $0.65/MWh to $32.00/MWh. Balance of the year, October through December 2017 was up $0.42/MWh to $33.32/MWh. In the calendar years, Cal 2018 increased $1.25/MWh to close at $35.70/MWh, while Cal 2019 increased $0.89/MWh closing to $33.74/MWh at the end of August. August 2017 PJM ComEd zone day-ahead on-peak closed $31.12/MWh, down $5.95/MWh from the July close. August 2017 MISO Illinois.Hub day-ahead on-peak closed $31.37/MWh, down $5.54/MWh from the July close. Statewide low August temperatures kept power prices down. Any references made to prompt month natural gas will normally be associated with a range starting the first day of the month through the final settlement of the respective prompt month natural gas contract. Other references to forward natural gas prices and all power prices will be based on a range starting the first day of the month through the final day of the month. This report made by AEP Energy contains projections and future expectations that are based on reasonable assumptions, but any such statements may be influenced by innumerable factors that could cause actual outcomes and results to be materially different from those anticipated, including (without limitation) changes in utility regulation and the allocation of costs within regional transmission organizations, including ERCOT, PJM, MISO and SPP.